Gorillas, the largest of the living primates, are ground-dwelling omnivores that inhabit the forests of Africa. Gorillas, previously considered a single species, were recently divided into two species and five subspecies. Gorilla DNA is 97%–98% identical to that of a human, and are the next closest living relatives to humans after the two chimpanzee species. Gorillas live in tropical or subtropical forests. Although their range covers a small percentage of Africa, gorillas cover a wide range of elevations. 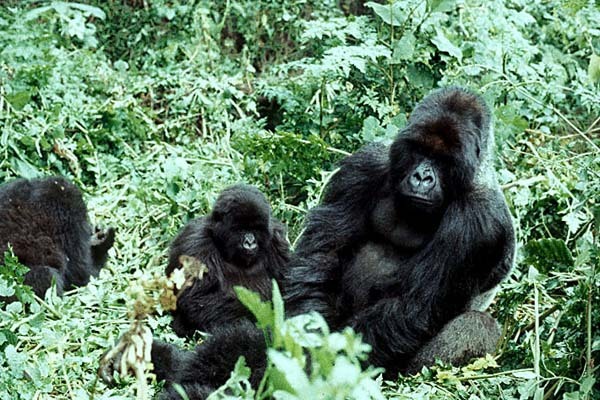 The Mountain Gorilla inhabits the Albertine Rift montane cloud forests of the Virunga Volcanoes, ranging in altitude from 2225 to 4267 m (7300-14000 ft). 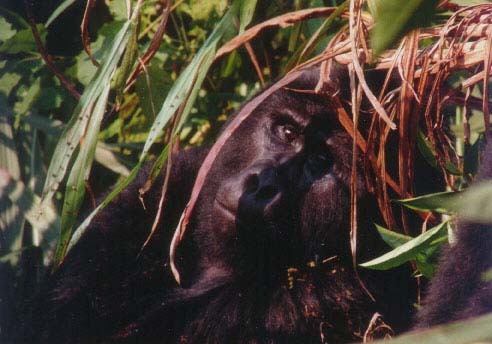 Lowland Gorillas live in dense forests and lowland swamps as low as sea level. The eastern gorilla (Gorilla beringei) includes the mountain gorilla (Gorilla beringei beringei) of the Virunga Volcanoes area of Rwanda, Uganda and the Democratic Republic of Congo, the yet unnamed, but distinct, population of Uganda's Bwindi (Impenetrable) Forest, and the eastern lowland gorilla (Gorilla beringei graueri). Western Africa is home to at least two additional taxa, the western lowland gorilla (Gorilla gorilla gorilla) and the Cross River gorilla (Gorilla gorilla diehli). 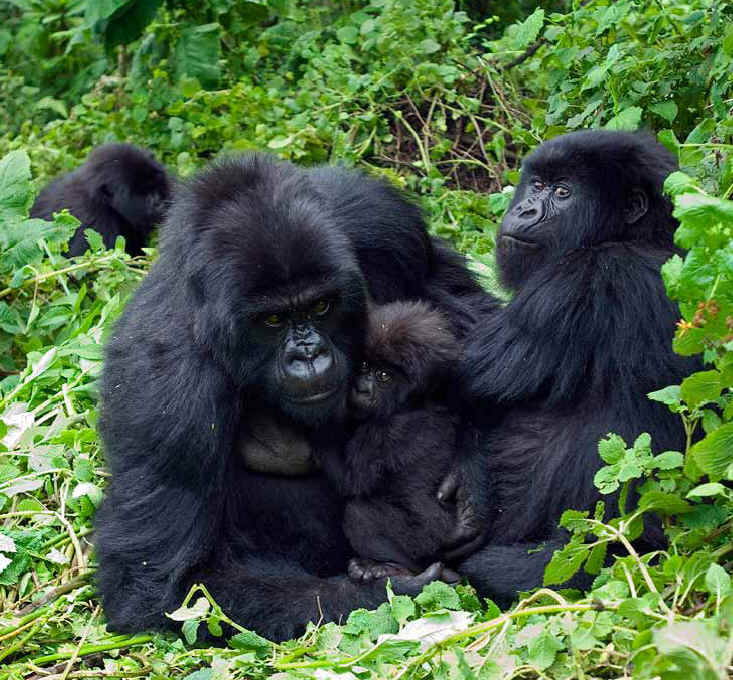 The mountain, Bwindi and Cross River gorilla populations all number only in the hundreds and are considered critically endangered. Ruhondeza. In Rukiga it means "one who sleeps a lot"
Approximately 4,000 free-living. Less than 24 in captivity. Found in eastern Zaire. Approximately 620 free-living. Zero in captivity. Found in 285 square miles in the rain forests of Rwanda, Uganda and Zaire. Gorillas are primarily vegetarians, and large quantities of food are needed to sustain their massive bulk. The gorilla has 48 chromosomes, like the chimpanzee, bonobo, and orangutan, with a very similar banding pattern to the 46 chromosomes of humans. They live in close-knit groups of five to 30 gorillas led by a patriarch - the large,dominant male called a silverback because of the distinctive grey saddle pattern that grows in at maturity.Even when they wander, gorillas rarely venture far - usually staying within a range of roughly 15 square miles in search of the shoots and berries they live on. Koko , a gorilla, has a working vocabulary of over 500 signs and has emitted over 400 more. Koko understands approximately 2,000 words of spoken English. Koko initiates the majority of conversations with her human companions and typically constructs statements averaging three to six words. Koko has a tested IQ of between 70 and 95 on a human scale, where 100 is considered "normal." Gorilla are endangered, and have been subject to intense poaching for a long time. The Ebola virus is depleting Western Gorilla populations to a point where it might become impossible for them to recover. Commercial hunting, civil unrest and habitat loss due to logging and forest clearance for palm oil plantations are compounding the problem. In Africa, forest is often referred to as 'the bush', thus wildlife and the meat derived from it is referred to as 'bushmeat.’ What is the Crisis? Commercial, illegal and unsustainable hunting for the meat of wild animals is causing widespread local extinctions in Asia and West Africa. It is a crisis because of rapid expansion to countries and species which were previously not at risk, largely due to an increase in commercial logging, with an infrastructure of roads and trucks that links forests and hunters to cities and consumers. 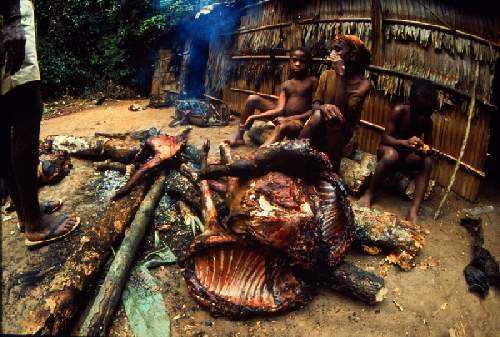 In most of Africa the demand is growing for the meat of forest animals-this is known as "bushmeat". 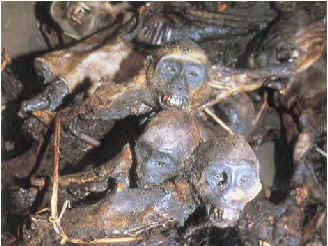 The "bushmeat" most in demand is that from Gorillas, Elephants and Chimpanzees. Thousands of hunters earn their living from slaughtering these animals. Some of the "notable" casualties have been the Gorillas Mushauuka, who was featured in the movie "Gorillas in The Mist" and Manheshe, who was featured on the Zaire 50E000 currency note. 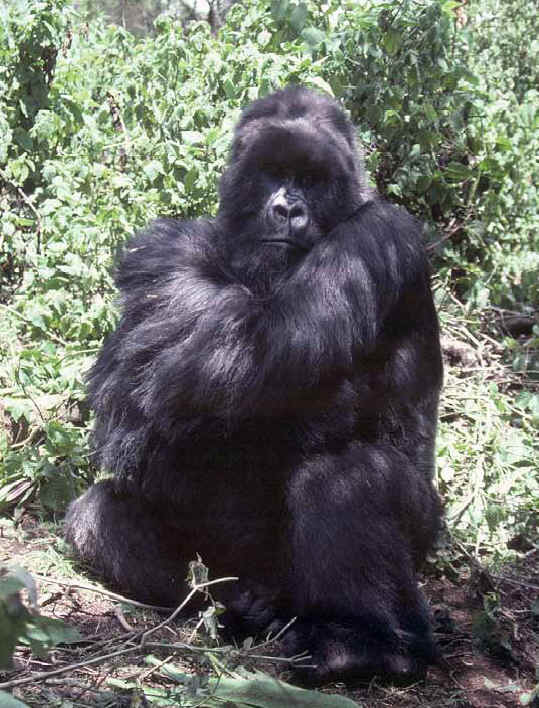 The Eastern lowland gorilla (Gorilla gorilla graueri) is found only in eastern Congo. In 1998, before the most recent wave of killings, there were fewer than 17 000 of them left alive. The loss in elephant numbers has been even more dramatic in the Kahuzi-Biega park, with a total population of 320 in 1996 reduced to fewer than 20, and possibly as little as five. 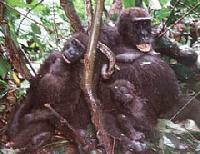 Mass slaughtering of Gorillas are occurring in the Congo where a bloody civil war is taking place. 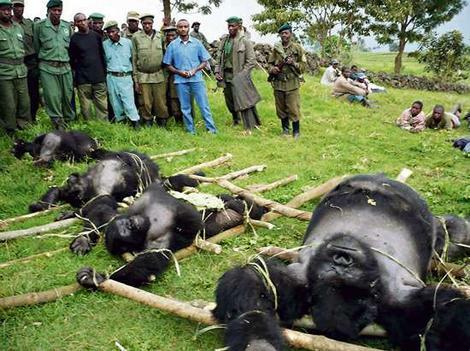 The combatants on both sides are killing Gorillas for food. Rare eastern lowland Gorillas and hundreds of elephants have been slaughtered in the Democratic Republic of Congo's Kahuzi- Biega national park near the Rwandan border since war first broke out in the area in 1996 - and the carnage is continuing. Meanwhile, in other parts of Congo, the war is threatening other vulnerable species. The rare Bonobo chimpanzees, which are only to be found in Congo, have the misfortune to live on the front line between the forces of Congolese President Laurent Kabila and rebel leader Jean- Pierre Bemba in Equateur province. The result has been their mass killing for bush meat, most of which appears to travel down the Congo river with Kabila's soldiers to Kinshasa. Although conservation groups are trying to mobilize action on the issue, the preservation of Congo's gorillas and other endangered species never came up during the Lusaka peace process, or during the week in January devoted to the Congolese civil war at the United Nations headquarters in New York. More gorillas and other endangered species seem sure to die at the hands of poachers - further casualties of Congo's brutal and seemingly never-ending civil war. Even in so called "protected area" of Africa poaching is rampant. The future and fate of these great creatures is in the balance. The obliteration and annihilation looks inevitable without immediate intervention.